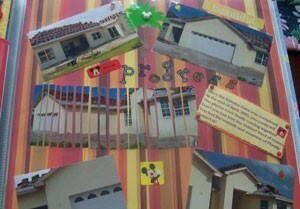 When scrapbooking, use your creativity. In this example, I cut the photo I was referring to in my journaling into several long strips. It was my sister's house which was finally being finished. I wrote "The pieces are finally coming together". It added some fun whimsy to the page and everyone thought it was clever!